In its third season, Friday Night Lights was shown on DirecTV’s 101 network. According to a MediaPost article, the show was available in 1.7 million homes and finished 7th among men 18-49. DirecTV has the rights to air all 13 episodes this season before the same episodes move to NBC early in 2009. The show airs commercial free in High-Definition (HD), and is sponsored by Unilever. 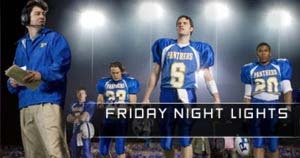 Pingback: Win-FreeStuff.com » Blog Archive » Do You Watch ‘Friday Night Lights’ TV Show?